"These thick pork chops have a smoky flavor, are very moist and tender, and the rub is easy to make. A family favorite, always requested at BBQs. I like to serve these chops with loaded baked potatoes and a garden salad." In a bowl, mix together the seasoned salt, black pepper, garlic powder, onion powder, paprika, Worcestershire sauce, and smoke flavoring until thoroughly combined. Rinse pork chops, and sprinkle the wet chops on both sides with the spice mixture. With your hands, massage the spice rub into the meat; allow to stand for 10 minutes. Grill the chops over indirect heat until no longer pink inside, about 12 minutes per side. An instant-read thermometer should read at least 145 degrees F (63 degrees C). Allow chops to stand for 10 more minutes before serving. 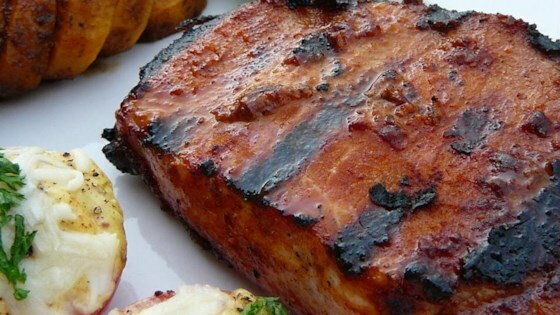 Grilled bone-in pork chops with a smoky marinade. Easy to make with pantry staples and most importantly, easy to scale down for 2 people without waste! These turned out delicious. Will definitely make these again. These were easy and unbelievably flavorful. They also have no oil. I used a little less liquid smoke and added some soy sauce. I am Portuguese and the flavor reminded me of Portuguese chorizo. Fantastic. Easy prep with ingredients we always have on hand. Very juicy chop. This is awesome. Made exactly as written.